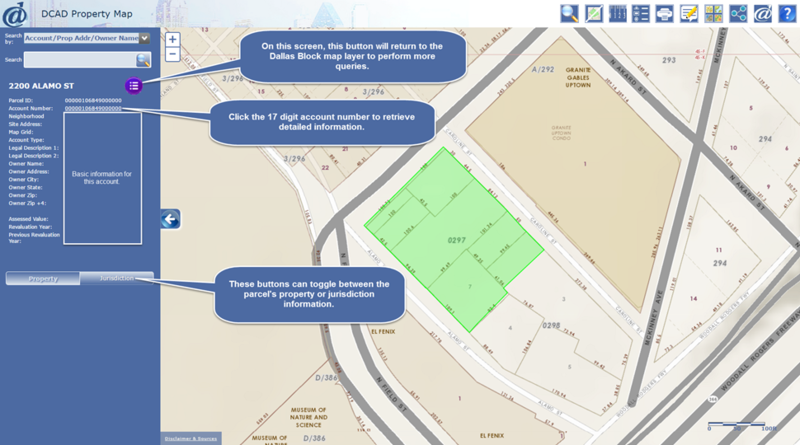 The Dallas Central Appraisal District (DCAD) Property Map offers an interactive, map-based view of parcel information that enables a user to locate an area of interest and identify property characteristics. The DCAD Property Map is a contemporary map, which means that changes made to new or deleted parcels since last certification are reflected in the current map. To download a copy of map data that matches the last certified appraisal roll please go to the GIS data products page. On January 12, 2016, Microsoft ended support for older versions of Internet Explorer. Only Internet Explorer 11 is supported by Microsoft. For more information, please see Microsoft.com. Compatibility view improves the display of older websites. These settings may be accessed in Internet Explorer by navigating and clicking on compatibility view settings located in the Tools menu drop down list from the menu bar. In the compatibility view settings dialog box, adjust any of the settings necessary to turn off compatibility view. Also, please ensure that dallascad.org or maps.dcad.org is not in the compatibility view List. For further information please consult Microsoft's documentation on this subject. To zoom in, click on the button. To zoom out, click on the button. To zoom in, hold down the shift key and click, or drag a box on the map display. To zoom out, hold down ctrl + shift keys and click, or drag a box on the map display. To pan, use up, down, left, right arrow keys to pan in various directions. You may also hold down the ctrl key and click on the map to pan. Using the ctrl key to pan is helpful when calculating large areas or distances with the measure tool. To zoom in or out, roll the mouse wheel forward or backward. To pan, click and drag the cursor in the pan direction. The left side panel is the repository for property information (i.e. account information, feedback, creating a print copy, etc.). It is collapsible by clicking on the button and expandable by clicking the button. To activate either of these methods, click on the Search Parcel button . In the side panel you may choose the map layer containing information for a parcel. In the side panel you will find the drop down arrow of the Search by: field. Click on the arrow and select the map layer you wish to identify. Account/Property Address/Owner Name is the default identifiable layer when the DCAD Property Map is opened. Each map layer contains thematic information for answering specific questions. Some layers include property, deed, legal, or land information while others are primarily for locating property (e.g., map index or neighborhoods). Account/Property Address/Owner Name: the results will return parcel information that includes the 17 digit account number, the site address, the owner's name, mailing address and market value information. 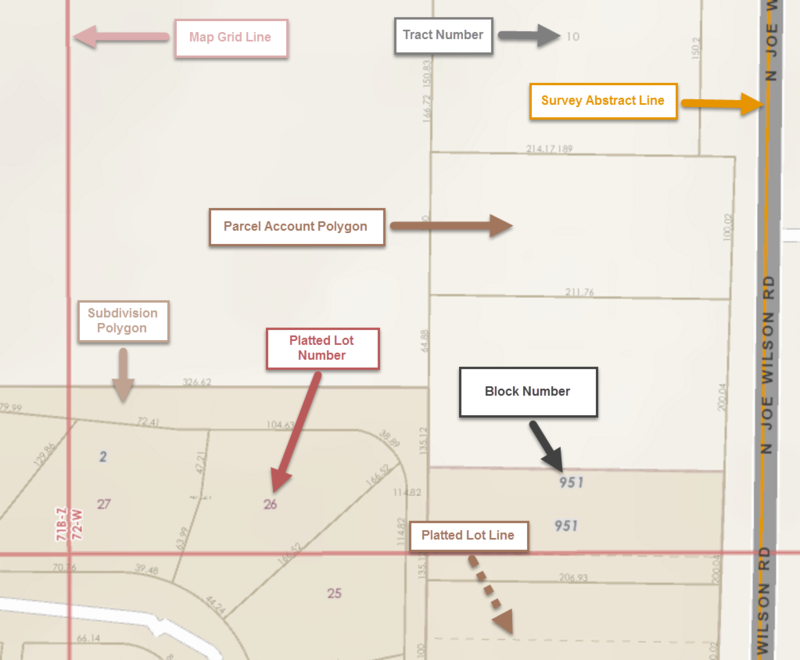 Subdivision/Condominium: the results will return a subdivision name or condominium name and the filed instrument number that it was filed at the County by. Survey Abstract: the results will return the abstract name and the abstract number. Map Grid: the results will return the page number and cell of the map grid. Dallas Block: the results will return the city of Dallas block number. Neighborhood: the results will return the DCAD residential neighborhood code. For further details on the results that may be returned for map layers, see the query/identify results section of this help document. The identify tool allows you retrieve information located at the cursor coordinate. To identify click on a map feature. Information for associated features will be returned in the left hand side panel. If more than one feature is associated with the parcel or map layer, a list of features is presented. When a list of features is returned, the number of features associated with the parcel or map layer is displayed above the list. Sorting buttons allow for alpha-numeric ordering of the feature list. Clicking a list item will return detailed information for the selected feature. To return to the list, click the button. Some search layers have the capability to retrieve accounts located within selected search features. If you click on the button, either a list of accounts, or (if there is only one account in that layer) a single account's information will display in the side panel. The identify tool may also be used for prior year, certified parcel check box layers (see the switch basemaps section). The result returned in the side panel will consist only of the certified account number as it existed for that year. Click on the account number link to obtain the account details page. To clear identify results you can click on the button in the tool bar. To activate search capability click the button. The search text box is located in the side panel underneath the search by drop down box. To perform a search for feature information in a map layer, type the information you want to search for in the text box. Examples for possible search terms are provided with each search item and displayed below the search text box. The search function is intuitive and will return results that match search terms. Entering Dallas in the search text box for the layer Account/Prop Addr/Owner Name will return any owner or street address that contains the word "Dallas". Refining the search to Dallas Appraisal will further constrain the result. Information for features associated with a parcel or map layer will be returned in the left hand side panel. If more than one feature is associated with the parcel or map layer, a list of all features associated with that parcel or map layer is displayed. If more than one feature is associated with the parcel or map layer, a list of features is presented. When a list of features is returned, the number of features associated with the parcel or map layer is displayed above the list. Arrows buttons provide alpha-numeric sorting of the feature list. Clicking on an item in the list will present an account detail window for the selected row. To return to the list, click the button. Account/Property Address/Owner Name: type in either the whole or part of the 17 digit account number, the property address (street number, street name or both), or the owner's name (first, last or both). Subdivision: type in either the whole or part of a subdivision or condominium name. Survey Abstract: type in either the whole or part of the abstract name or number. Map Grid: type in the page number of the map grid. Dallas Block: type in the city of Dallas block number or letter/number. Neighborhood: type in the residential neighborhood code. To clear search results click the button. All results are removed from the map and the side panel resets to its default state. Whether you are using the search or identify tool, results depend on the selected search by item (see available map layers section in the help). This section will define retrieved information for each search item. For each result, two tabs provide both property and location specific details. The property tab provides account information for the selected feature. Parcel ID: Parcel identification number. In some cases there may be duplicate parcel ids. Account Number: The DCAD account number for residential, commercial and business personal property accounts. The account number also is a link to the account details page. Some business personal property accounts may not be feasibly displayed or queried using this application. Access the main DCAD website to access these account details. Neighborhood: The DCAD Residential Neighborhood code used for all residential accounts. Site Address: The physical address for the account. This is provided by the municipality where the parcel is located. Newly created accounts have the lot number as the site address, until a formal house number is received from the municipality. For questions regarding site addresses, please review our FAQ page. Map Grid: A geographic index that subdivides the county. Account Type: Commercial, residential or business personal property. 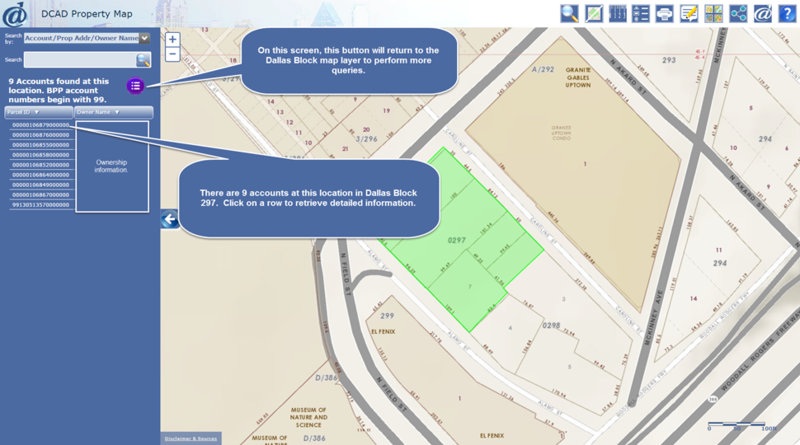 Legal Description 1: Information about the subdivision, survey abstract, or Dallas City block. 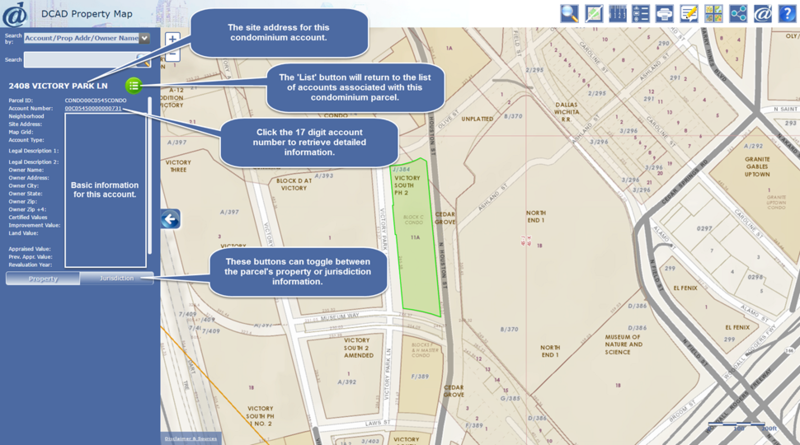 Legal Description 2: Information about the lot, block, tract, or area. Owner Name: Owner specified on the last deed filed. Owner Address: Mailing address for the owner as it appeared on the last deed filed. Owner City: Mailing address city for the account owner. Owner Zip: A 5-digit mailing address ZIP code for the account owner. Owner Zip +4: A 4-digit mailing address ZIP code suffix for the account owner. Improvement Value: The DCAD certified market value for any improvements located upon the parcel. Land Value: The DCAD certified market value for the land. Market Value: The combined certified market value for all improvements and land. Prev. Mkt. Value: The combined certified market value for all improvements and land from the previous appraisal year. Revaluation Year: The year that the account was re-valued. Previous Revaluation Year: The previous year the account was re-valued. Subdivision/Condo Name: The name of the subdivision, addition or condominium as it was filed on record at Dallas County Deed Records Office. Subdivision Type: The type of subdivision (subdivision or condominium) as it was filed on record at Dallas County Deed Records Office. Subdivision/Condo Acreage: The acreage of the subdivision or condominium. Volume/Page: The book volume and page or instrument number that the subdivision or condominium was filed on record at Dallas County Deed Records Office. Subdivision/Condo City: The municipality that approved the subdivision or condominium that was filed on record at Dallas County Deed Records Office. Survey Abstract Name: The name of the grantee on the patent who acquired the land from the General Land Office of Texas. Survey Abstract Number: The abstract number for the plat of the patent that was acquired from the General Land Office of Texas. Map Grid Number: The selected map grid number and cell. Map Grid Number (North): The map grid number and cell north of the selected map grid. Map Grid Number (South): The map grid number and cell south of the selected map grid. Map Grid Number (East): The map grid number and cell east of the selected map grid. Map Grid Number (West): The map grid number and cell west of the selected map grid. Block Number: The platted block filed at the Dallas County Deed Records Office or block annexed by Dallas city ordinance. Block City: City where the block is located. Neighborhood Identifier: The DCAD neighborhood code for a residential assessment area. 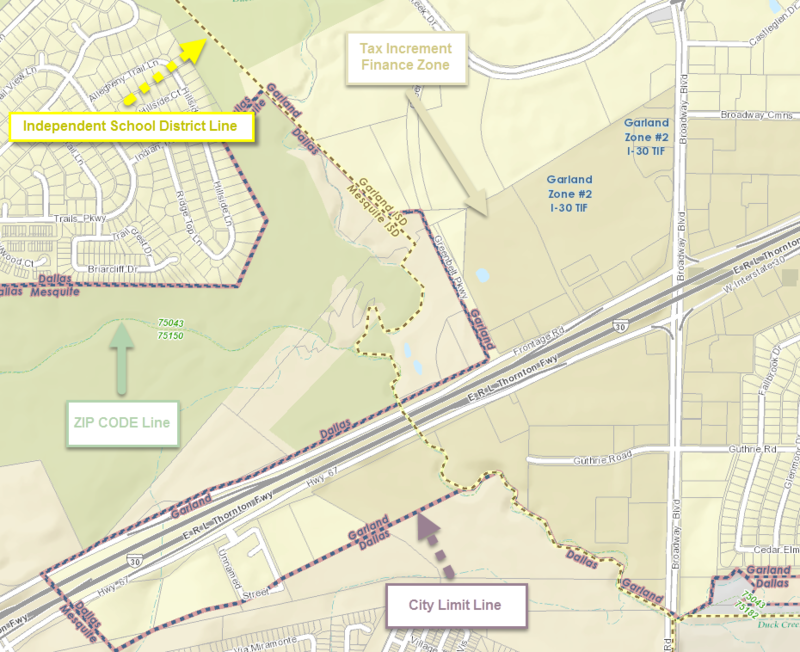 The jurisdiction tab displays city, school and special district, tax increment reinvestment zone, and flood plain region labels for the selected parcel's center point. A list of regions included in the jurisdiction tab are provided below. Tax Increment Finance Zone (TIF): The tax increment finance zone used for publicly subsidized economic development or municipal projects. Independent School District (ISD): Local school district. Different from school attendance zones. Special Tax District: Special taxing region such as a municipal utility district (e.g., MUD). FEMA Flood Plain (NFHL): The flood plain designation. A translation table is provided for cross referencing old flood plain terms with FEMA's flood zone definition. To clear search or identify results click on the button in the tool bar. The measure tool allows the user to obtain distances, areas, and coordinate locations. Click on the map to draw a line, polygon or point to obtain measurements. Use the keyboard keys (see map navigation section) to navigate the map, while the measure tool is activated, to alter the map extent. Each button has default units. For area measurement the default unit is acres. Distance and coordinate measurements are feet and degrees respectively. Other measurements units are available. The measure tool has three action buttons that execute measurement operations. When the area feature has been selected, click once at a beginning location. Using single clicks place subsequent points for the area desired. Once complete, double click to finalize the area boundary. Measurement results display in the dialog box. To view additional measurement units, select the desired scale in the drop down menu for the recently created area polygon. When the distance feature has been selected, click once at a beginning location. A marker identifies selected locations. Using single clicks place subsequent points distance desired. 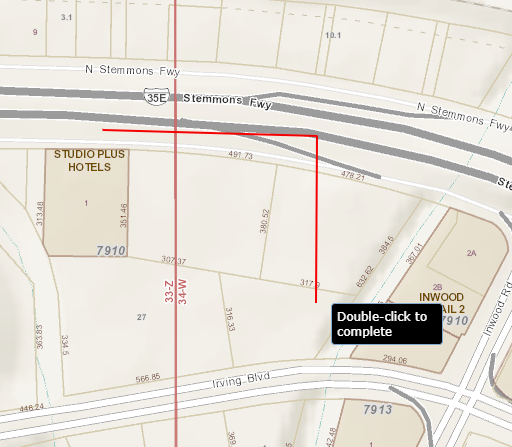 Once complete, double click to finalize distance segment(s). 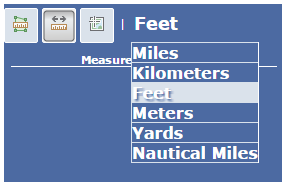 Distance measurements are cumulative; however, each segment's distance is reported in the dialog box. To view additional measurement units, select the desired scale in the drop down menu for recently created line segment(s). When the location feature has been selected, click once at a desired coordinate location. This measurement unit reports latitude and longitude. The default measurement scale is decimal degrees, but angular units are also available. To close, click the close or measure tool button in the toolbar. For best results, deactivate (turn off) the action button before closing the measure tool. The legend tool opens in the left side panel and provides information for the symbology of each basemap and operational layer. Click either the close legend or toolbar legend button to close. When turned on, the FEMA flood plain layer is altered using a transparency level of approximately 30% in order to view underlying basemaps effectively. This alteration makes FEMA map layer display difficult to match with legend thumbnails for this layer. Colors will be slightly more subdued and lighter than depicted in the legend. Please consider this when making judgments on flood plain descriptions. The locate tool selects the parcel reported by the GPS receiver of the mobile device consuming the map application. The location services settings on your smart phone or tablet must be activated in order to use this tool. The mobile GPS receiver provides more precise locations outdoors. Using this tool indoors may produce poor coordinate precision. A parcel must be selected in order to use this tool. Once a parcel has been selected, the user can print by clicking the button on the toolbar. This action opens a dialog box in the left side panel. To obtain a PDF map in a new browser tab, select the option to print "...in a new browser window." This is the default option; however, a user may also select the option to open the PDF copy in the same browser window. This will require the user to click the back button on the browser window to return to the application. The user then selects the layout and enters a map title. Click the download button to create the PDF. The user may either print or save the results. A browser's pop up blocker may prevent the new print copy from being seen. Most browsers will request permission to allow pop up display. Allow the browser to display the pop up in order to see the printed PDF. Click on the Submit Feedback button in the toolbar to activate the submit feedback dialog box. At the top of the left side panel, a drop down text box provides inquiry types. This ensures feedback is forwarded to the appropriate department. Real Property: Relates to information in the side panel (i.e. ownership, subdivision name, lot, block, etc.). Map Cartography: For display of map content (i.e. parcel lines, roads, etc.). 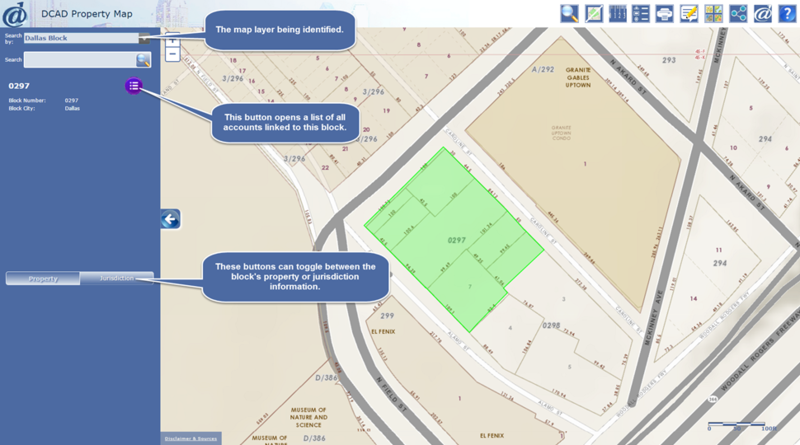 For inquiries related to aerial hybrid basemaps select the web map functionality inquiry type. Business Personal Property (BPP): For questions regarding business personal property. Web Map Functionality: For interactive web map use (i.e. malfunctioning tools, unexpected results, error messages, etc.). General: Comments or questions not relevant to other inquiries. 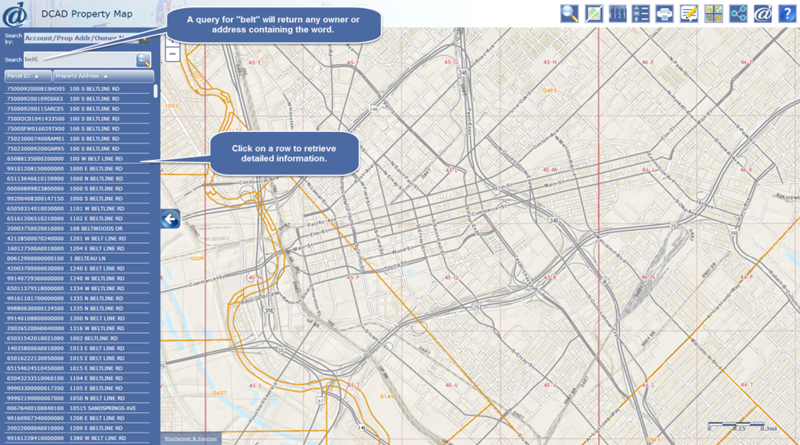 Click the draw button to initiate a canvas for drawing an area of interest boundary on the map. This highlights the area in question. Click once at a map location to begin drawing the polygon. Subsequent single clicks compose the area of interest. Double click to complete the area of interest boundary. To alter or recreate the area of interest, click the "Redraw" button. An area of interest is required to submit feedback. Enter comments that describe the question or issue. To receive a response, please provide your contact information. Click the submit button when finished. The website will report if the submission is successful. You will be contacted by a customer service representative within five to seven business days. We appreciate your feedback. 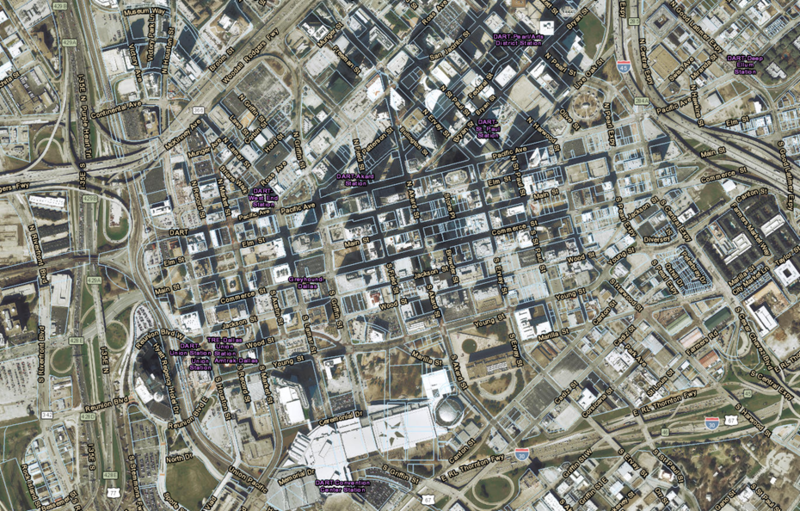 The DCAD Property Map provides fast performance and search capability by leveraging basemaps. 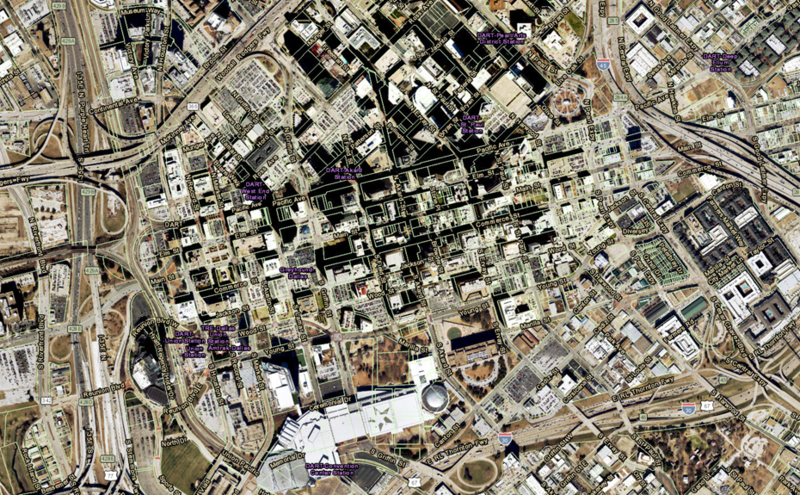 Basemaps are map backgrounds comprised of thematic map content stored as images. Images are tailored for the scale and resolution of the map display. Other information such as account numbers, owner and property addresses, etc., is provided using operational layers. Operational layers report data when selected, queried, turned on, or clicked in the web application interface or map display. A variety of real estate, natural resource, and ownership data sources are combined in four basemaps and seven operational layers. These are described in more detail below. The website offers a choice of four basemaps and seven operational layers. 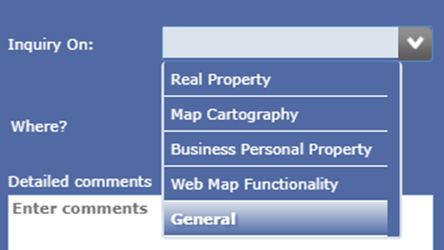 The default basemap is the Current Property Map. Clicking on a basemap presents the selected map content in the display area. Current Property Map: Shows recent changes to subdivisions, blocks, parcels, and dimensions. The Current Property Map does not represent certified map data. To access this data, use the appropriate prior year certified parcel layer. To download current or prior year map data, see the Download DCAD GIS Data section. Jurisdictions: Shows cities, school districts, special tax districts and tax increment reinvestment zone boundaries. 2015 Hybrid: Shows 2015 orthophotographs with current year parcel boundaries. Street names and addresses are provided by esri. For questions regarding these street names please go here . 2017 Hybrid: Shows 2017 orthophotographs with current year parcel boundaries. Street names and addresses are provided by esri. For questions regarding these street names please go here . There are seven operational layers that can be turned on or off. When a user toggles an operational layer's check box, the selected parcel layer is displayed over (on top of) the selected basemap. When a certified parcel layer is displayed, only historic parcels are presented in the side panel. The parcel id presents a link to the account history page. 2016 Certified Parcels: Side panel displays account history link for historic 2016 parcel boundary. 2015 Certified Parcels: Side panel displays account history link for historic 2015 parcel boundary. 2014 Certified Parcels: Side panel displays account history link for historic 2014 parcel boundary. 2013 Certified Parcels: Side panel displays account history link for historic 2013 parcel boundary. 2017 Certified Parcels: Side panel displays account history link for historic 2017 parcel boundary. FEMA (NFHL) Flood Zone***: Shows flood zone boundaries produced by FEMA and labels appear in jurisdiction tab and on map display. Hosted and maintained by FEMA. Please visit the FEMA.GOV web site for more information. NCTCOG Elevation Contours: Two foot elevation contours produced by NCTCOG are for display only. Elevations are labeled. Map display may be shared using various social media services. Apart from composing an email containing a map link, user map post a link to FaceBook or Twitter. Users are required to login to social media accounts when accessed. The DCAD home page button links to the main website at www.dallascad.org. To download available GIS data please go to GIS Data Products page. To download available appraisal roll data please go to Data Products page. Map data may be accessed as a service by going to the DCAD service directory. It is understood that the data displayed through this application is subject to constant change and that its accuracy cannot be guaranteed. The maps have been created from information provided by various government and private sources at various levels of accuracy. The data is provided to you "as is" with no warranty, representation or guarantee as to the content, sequence, accuracy, timeliness or completeness of any of the information provided herein. It is the responsibility of the user of the data to be aware of the data's limitations and to utilize the data in an appropriate manner. This product is for informational purposes only and may not have been prepared for or be suitable for legal, engineering, or surveying purposes. It does not represent an on-the-ground survey and represents only the approximate relative location of property boundaries. DCAD strives to ensure the accuracy of provided data it maintains. City and county organizations are the sole owners of site (property) addresses and therefore are the authorized stewards for their maintenance. When creating new accounts or parcels, DCAD uses a generic number for the site address until the jurisdiction provides an updated property address. An address may also be corrected if one of our appraisers has visibly confirmed the property address in the course of their duties. If there is a concern that the property address for an account or parcel is in error, please contact the city or county jurisdiction in order to confirm the property address. Once a site address error is confirmed, please ask them to notify DCAD either through a letter (official letterhead) or by email to the Dallas Central Appraisal District at dcs@dcad.org. For a list of jurisdictions' websites, please visit the links tab. The current basemap shown on the DCAD Property Map is not the same as the map for the certified appraisal roll. 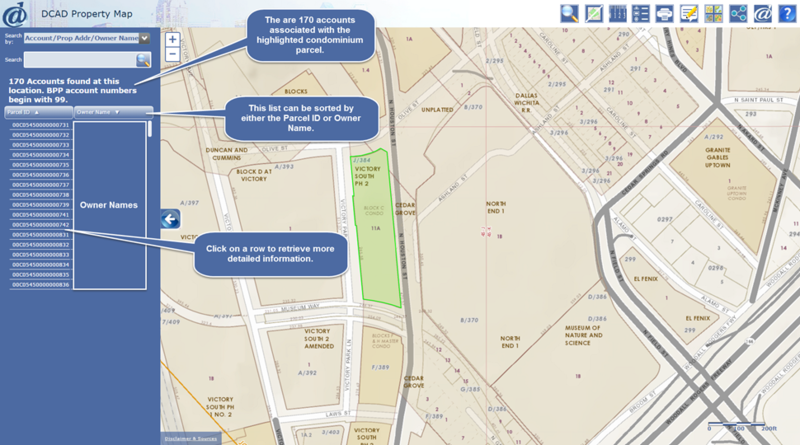 The current base map displays recent parcel changes, newly created parcels and omits recently deleted parcels since the last certified appraisal roll. If you are in need of the last certified appraisal roll and corresponding map data please visit Data Products and GIS Data Products respectively. Prior year parcel files are representations of boundaries as they were at certification each year. This is typically before July 25th. Aerial Imagery - DCAD displays aerial imagery as a service to the public but is under license agreement not to provide images for download or services for reuse in desktop or web mapping applications. This photography is 6 inch resolution natural RGB imagery captured biennially through a cooperative effort hosted by NCTCOG. Elevation Contours - DCAD purchased elevation contours from NCTCOG for use in map applications. They represent points of equal elevation on a geographic plane. For information regarding the accuracy of the product please consult NCTCOG's data description page. Any official declaration of elevation should be confirmed by a state registered and licensed surveyor. Flood Plain - DCAD neither maintains nor guarantees flood zone information. Verify flood zone information directly through FEMA's flood map service center. The information provided on this website is hosted on a different server by FEMA. Their organization manages the FEMA flood plain web service and DCAD simply references web applications. For questions regarding this web service and FEMA data please go to FEMA's flood plain layer description page. To download a copy of digitized map data visit GIS Data Products. Learn how to link account information with digitized parcel data by reading the included PDF document. To obtain appraisal roll data visit our Data Products link. Map data may also be accessed by using the DCAD service directory. Service directory rest endpoints may be used in many mapping applications. Here are the most frequently asked questions regarding various topics surrounding the DCAD property map website. Select the button next to a question below to open or close answers to frequently asked questions. For assistance on how to use the DCAD Property Map and its tools, please visit our Help page. For the Frequently Asked Questions page supporting the main Dallas Central Appraisal District website please refer to this F.A.Q. page. How can I change my mailing address? Can I change my mailing address by phone? To protect the interest of property owners, it is DCAD's policy to require a written request to change a mailing address. Permanent mailing address changes will not be accepted by the telephone. You may send your written request by mail, email or fax your request. Please indicate the correct mailing address and daytime phone number where you can be reached or complete the Mailing Address Change Request form. Please send DCAD your Mailing Address Change Request by one of the following methods. To send by email: pre@dcad.org. What can I do if DCAD has the wrong property address for my new house? Verify the accuracy of the physical address by contacting the address' governing city or county jurisdiction. If the city or county jurisdiction confirms that DCAD's address records need to be updated, please ask them to notify DCAD using one of the methods below. Any notification must be provided on official letterhead. For a list of jurisdictions' websites, please visit our links web page. Please send DCAD property address confirmation by one of the following methods. What can I do if DCAD has the wrong property address for my existing house? DCAD strives to ensure the accuracy of the property street address (or SITUS) for the accounts and parcels it maintains. Property addresses are updated and maintained by the jurisdiction where they are located (either a municipal city or county). 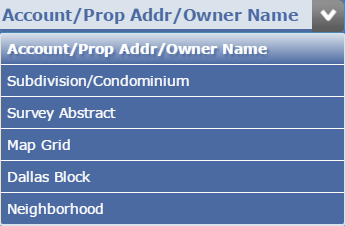 When creating new parcels, DCAD uses a generic number for the property address until the jurisdiction provides the updated property address. Corrections are also made when an appraiser visibly confirms the property address during field inspections. What can I do if DCAD does not reflect the current ownership of a property? After 90 days from the date the deed was filed with the county clerk, if the appraisal record does not reflect the current ownership, please contact the Property Records Exemptions Department. To notify DCAD of ownership issues in the DCAD Property Map. The Submit Feedback Tool is located in the tool bar of the DCAD Property Map. For help on using this tool please refer to Submit Feedback section in the on-line help document. The Share Map Tool is located in the tool bar of the DCAD Property Map. For help on using this tool please refer to Share Your Map section in the on-line help document. To better serve you, it would be helpful if you could provide either the filed deed document's reference number or instrument number which was stamped by the Dallas County Clerk's office, deed recording section of the recording division. I sold part of my property... Why is this not reflected in the map? After 90 days from the date the deed was filed with the county clerk, if the web map does not display the new or adjusted boundary, please notify the Property Records Exemptions Department. Use the Submit Feedback Tool which is located in the tool bar of the DCAD Property Map. For help on using this tool please refer to Submit Feedback section in the on-line help document. How can I determine if my property is in the flood plain? DCAD does not update or maintain FEMA GIS data. The FEMA (NFHL) Flood Zone layer that is available for viewing in the DCAD Property Map is provided directly from FEMA. The Switch Basemap Tool is located in the tool bar of the DCAD Property Map and can be used to view the FEMA (NFHL) Flood Zone Layer. For help on using this tool please refer to Operational Layers section in the on-line help document. The DCAD Property Map also allows the user to see if a specific parcel is in a FEMA (NFHL) Flood Zone. When a user selects a parcel in the map and the parcel's information is populated in the left side panel, there is a jurisdiction tab underneath the parcel information. When the Jurisdiction tab is selected, all jurisdictions including the FEMA (NFHL) Flood Zone Layer that the parcel resides in are provided. 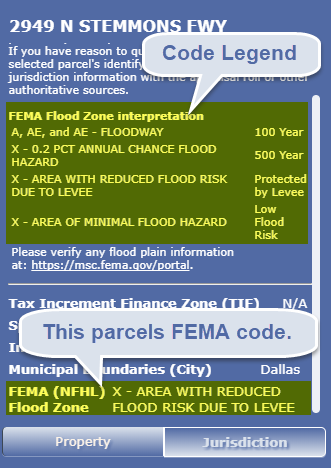 A FEMA code legend is also provided to assist the user. Please visit the FEMA.GOV web site for more information. 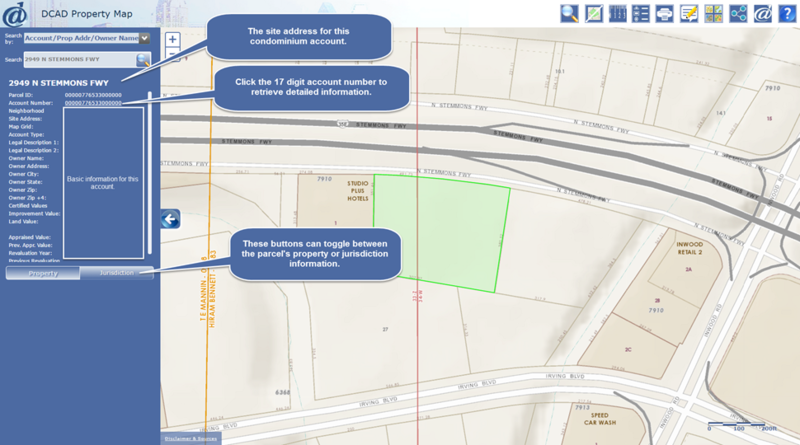 Why are the dimensions wrong for the parcel in the DCAD Property Map and does this affect the taxable or market value? Geographic data does not affect property valuation where square footage, acreage and or property dimensions might be considered. For any property that considers the parcel size for its market value, DCAD uses information in the legal description from deed documents or recorded plats filed at the Dallas County Clerk's office deed recording section of the recording division. 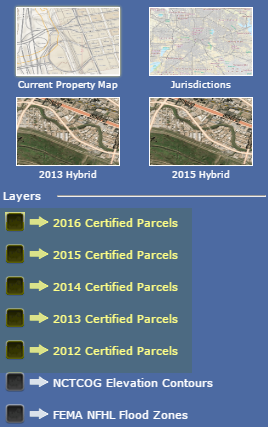 DCAD has updated and maintained map layers since 1997. For decades, DCAD used the same computer applications to update map layers to maintain data integrity. In 2012, DCAD upgraded to a parcel maintenance system because existing applications were obsolete. This upgrade was able to migrate all of the map layer data without issue, except for the parcel dimensions. As there are a large number of parcel dimensions in Dallas County, it was decided that our editors would update dimensions through standard parcel maintenance procedures. Where are the FEMA or prior year Certified Parcel map layers? Visibility of check box map layers is scale based. If the zoom level is over a large area, dynamic map layers will not be visible. If you zoom in on the map, dynamic map layers will become visible. Why do I get a pop up message (Parcel not found...). The website represents a contemporary map, meaning parcel updates since last certification, are presented in basemaps. When DCAD obtains copies of filed legal documents, map content updates accordingly. Updates are published each night in each basemap. For more information about data sources, please see Disclaimers & Sources. This message occurs because the selected coordinate does not currently contain a parcel. There are a couple of reasons for this. DCAD is currently updating the missing parcel. In this case the missing parcel should be available the next day after the publishing process completes. A system issue prevented the publishing of the missing feature into the parcel service. The parcel does not exist, such as right of way owned by a taxing jurisdiction, or rail road. Use the Share Map Tool which is located in the tool bar of the DCAD Property Map. For help on using this tool please refer to Share Your Map section in the on-line help document. Why can I search for and identify a parcel but I do not see the parcel boundaries in the DCAD Property Map? The DCAD Property Map is designed as an interactive GIS map that uses a mix of static cached basemaps for viewing and hidden dynamic map layers that allow the user to search and identify GIS data. On occasion dynamic layers provide parcel selection, while the visible cached map image displays pre-existing boundaries. For more information on basemaps, please see Switch Basemap section in the Online Help. If you find this issue, please feel free to contact us and we will investigate the matter and update the stale image as soon as possible. Use the Share Map Tool which is located in the tool bar of the DCAD Property Map. For help on using this tool please refer to Share Your Map section in the Online Help. 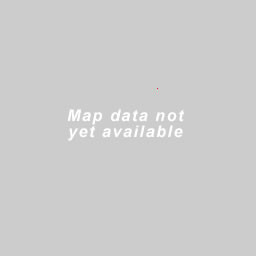 Why do I see "Map data not yet available" in the map? then a system issue may have occurred that prevented creation of the basemap image. For more information on basemaps, please see the Switch Basemap section in the Online Help). If you find this issue, please feel free to contact us and we will investigate the matter and update the cached basemap as soon as possible. Use the Submit Feedback Tool which is located in the tool bar of the DCAD Property Map. For help on using this tool please refer to Submit Feedback section in the Online Help.